No Love Allowed is one of those books that once it was over I kind of felt sad about it. I really enjoyed the characters and the story. I read the book in a 24hr time span too so you can tell I was completely submerged. 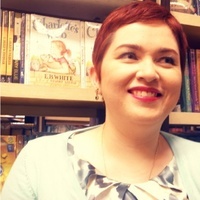 Kate Evangelista is one of those authors that you can also count on an awesome, confident female lead. Didi is someone who has definitely struggled but she is has accepted the detour her life has taken. She is also very proud of where she comes from and has fantastic relationship with her mom. I love her artist and free spirit. Didi is the perfect compliment to Caleb. He’s not looking to commit to anyone and is just trying to escape life circumstances. He has experienced loss and struggles in a different way than Didi. They find themselves forming a bond and a relationship of understanding. I also really loved Caleb’s cousins Tash, Nathan and Preston (not cousin but kind of like one). 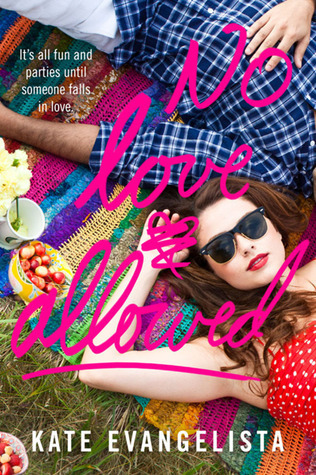 There are swoony moments in No Love Allowed, even with the rules. There is not instalove in sight and everything develops at a natural pace. Caleb and Didi definitely start out as friends and things just start to change from there. I like that the book tackles mental illness and how it deals with it. My brother actually has the same issues as Didi and I think sometimes people have a misconception about how detectable some of the illnesses can be. You might not even realize someone is being treated for one. There is also the issue of medication, some of the treatments can cause a person to feel empty which is why you find that people can sometimes stop taking it. I thought this book shows this in such a great way. It’s gentle instead of exploding it in your face, giving the reader a better understanding. I’m breaking Caleb’s rules and saying I loved No Love Allowed. I have had good experiences with Kate Evangelista’s books and this might be one of my favorites of hers now. I’m always happy with how awesome her female leads are and she creates the swoony romance well.